not a mushroom, but a parasitic fungus that grows on mushrooms. 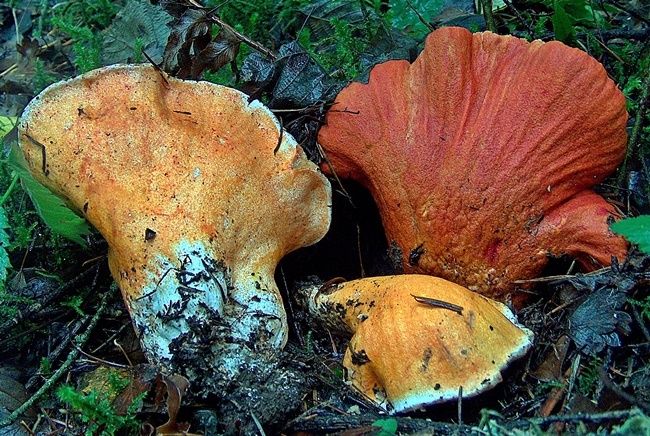 the fungus turns the host mushroom a bright reddish orange. the fungus deforms the surface of the host mushroom to be coarse, cracked, and dotted with tiny white pimples. the fungus eventually twists the mushroom into an irregular shape, making the host unidentifiable. has a seafood-like flavor that is highly variable. has a firm, dense texture. fresh specimens have a white interior. appears in summer and fall following rainy weather.